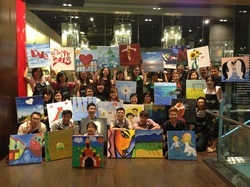 Art Jamming Teambonding sessions are designed to take the norm of competition and complexity of teambuilding sessions out of the window. We introduce the simplicity of Art and provide an avenue of creativity for you to release your tiredness and stress through painting! Enjoy an exclusive use of the art studio for your team and let your artistic mind fill the canvas with colours. A typical Art Jamming session allows you to have the freedom to paint from any sample pictures provided or you could customise to have a Collage Design where each individual's drawing are combined to form 1 fabulous picture! The possibilities are endless, so contact us now for your own jamming session. Distance Traveled: Till the paint runs dry! "Need some means to vent the stress and tiredness for the office team? Vent it on the canvas and paint to your heart desire!"